PracticeLink.com W INTER 2018 29 R E F O R M R E C A P physician who opts out must do so for all of the physician's Medicare patients. Proposals to change the law would allow physicians to obtain reimbursements at normal rates from Medicare and balance- bill the patient for an agreed additional amount. The additional payments could be determined on a patient-by-patient or service- by-service basis. A report by the Kaiser Family Foundation notes th ree a rg u ments in support of these changes: • Higher payments to physicians to offset what some view as unduly low payments from Medicare that do not keep up with practice costs. • Increasing the number of physicians willing to accept Medicare patients. 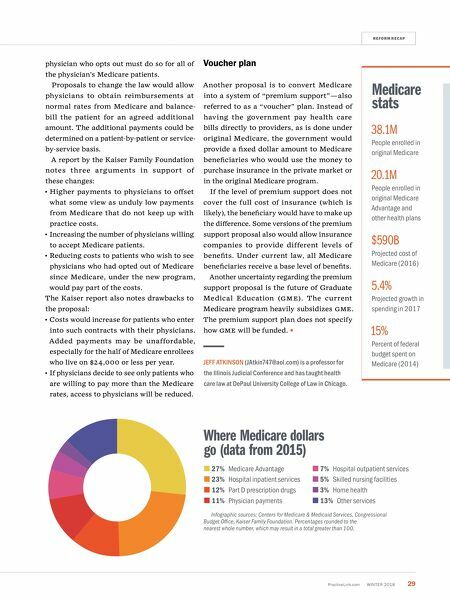 • Reducing costs to patients who wish to see physicians who had opted out of Medicare since Medicare, under the new program, would pay part of the costs. The Kaiser report also notes drawbacks to the proposal: • Costs would increase for patients who enter into such contracts with their physicians. Added payments may be unaffordable, especially for the half of Medicare enrollees who live on $24,000 or less per year. • If physicians decide to see only patients who are willing to pay more than the Medicare rates, access to physicians will be reduced. 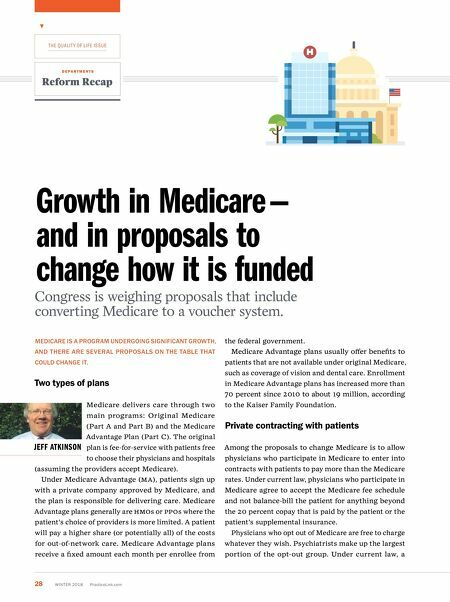 Voucher plan Another proposal is to convert Medicare into a system of "premium support"— also referred to as a "voucher" plan. Instead of having the government pay health care bills directly to providers, as is done under original Medicare, the government would provide a fixed dollar amount to Medicare beneficiaries who would use the money to purchase insurance in the private market or in the original Medicare program. If the level of premium support does not cover the full cost of insurance (which is likely), the beneficiary would have to make up the difference. Some versions of the premium support proposal also would allow insurance companies to provide different levels of benefits. Under current law, all Medicare beneficiaries receive a base level of benefits. Another uncertainty regarding the premium support proposal is the future of Graduate Medical Education ( g M e ). The current Medicare program heavily subsidizes g M e . The premium support plan does not specify how g M e will be funded. JEFF ATKINSON (JAtkin747@aol.com) is a professor for the Illinois Judicial Conference and has taught health care law at DePaul University College of Law in Chicago. Medicare stats 38.1M People enrolled in original Medicare 20.1M People enrolled in original Medicare a dvantage and other health plans $590B Projected cost of Medicare (2016) 5.4% Projected growth in spending in 2017 15% Percent of federal budget spent on Medicare (2014) Where Medicare dollars go (data from 2015) 27% Medicare a dvantage 23% Hospital inpatient services 12% Part D prescription drugs 11% Physician payments 7% Hospital outpatient services 5% Skilled nursing facilities 3% Home health 13% o ther services Infographic sources: Centers for Medicare & Medicaid Services, Congressional Budget Office, Kaiser Family Foundation. Percentages rounded to the nearest whole number, which may result in a total greater than 100.